This production is a parody tribute to Night of the Living Dead meets Disco Inferno with a nod to The Rocky Horror Picture Show. An unusual space/time anomaly has allowed a group of Zombies to roam the earth to see if a zombie can find true love with the living. 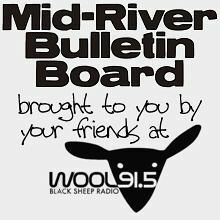 The Mid-River Bulletin Board is facilitated by WOOL-FM.